I am a Christian. God gave me the ability to juggle, and I am determined to use this ability to His glory whenever possible! The Gospel Juggler teaches all about Christianity whilst entertaining many stories and routines which can be adapted to fully fit in with your own event. Christian Jugglers Association (CJA) Christian Magicians UK. I currently have 2 x 1hr+ Shows available to be used as an effective Outreach Event (the sort of friendly event that you can encourage your Non-Christian friends to come along to, or perhaps use as a ticketed show during your Outreach Week. 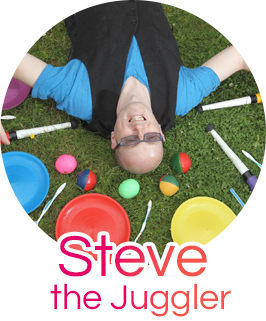 SHOW #1: Steve’s 1hr Gospel Juggling Show – The show starts with a section “All About Jesus” and moves gradually towards the end theme of “Salvation”. The routines can be adapted depending on the ages and stages of faith of the target audience, so the more information you can provide about what you want to achieve from this Outreach Show, the more I can tailor it to fit. SHOW #2: Parables Show. (running time approx 60-75mins plus possible 15min interval). 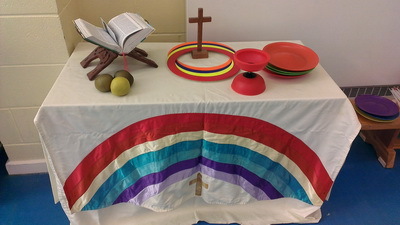 Let Steve take you on a Circus Skills-filled journey through the Parables found in the Bible which break down nicely into covering topics such as Humility, God’s Love for us, God’s Values, Wealth, Service and Obedience, Prayer etc (which can all be performed together in one big show, or split into nice 10-15min chunks for other occasions! Juggling Balls, Rings, Clubs and Scarfs, Binbags, Eggs! Lots of Magic, Music and (controlled) Mayhem! An optional 10-15min Fire Juggling show as the final part of your event. This does involve the show moving outdoors to a clear space though! If you are planning an outreach of any kind, then the 1hr show (or any timings up to 1hr such as a 30min show) may work well within your schedule. As you can see, the show is packed with a wide variety of skills! Christian themes are performed and discovered throughout the hour, and the show is very light hearted and friendly, packed with jokes and audience participation (whether it is singing a song or picking people out of the audience). There is something for everyone! I have well over 400 routines (using a wide array of Circus Skills and Magic and Puppetry props) at my disposal, so I will be able to match whatever theme you may have and tailor the routines for the ages of the audience and for the stage of faith you require (eg non believers, strong believers, complete mixture)! As most people will never have seen someone juggling while giving a Christian message before, they will become entranced by it and the message will stick in their minds! Sharing God’s Word using short entertaining and challenging routines featuring the use of juggling, comedy, magic, Circus Skills, challenges, audience participation and songs. This is particularly effective with an all-age audience, but can equally be used during a visit to a Youth/Childrens club, Praise Party or any other kind of outreach. The shows can be as little as 10min long and included as part of a Circus Skills Workshop, or they can be much longer (anywhere up to 1hr). I can perform the same or a different show several times during your event if you would like to make sure that most people at your event get the chance to see the show! The show can be interspersed with secular juggling (juggling with no Christian message – just good clean entertainment) if you would prefer for me to gather a crowd before performing the message part of the show. and leave some comments if you have time! I am a member of Christian Magicians UK. Extras: A juggling workshop could be offered on the same day as the show. If performing on a Sunday, I could also have a slot in the Church service (which can help promote the Show and therefore increase attendance). For more ideas on how to use me as part of your outreach, please visit the main Christian Juggling page.